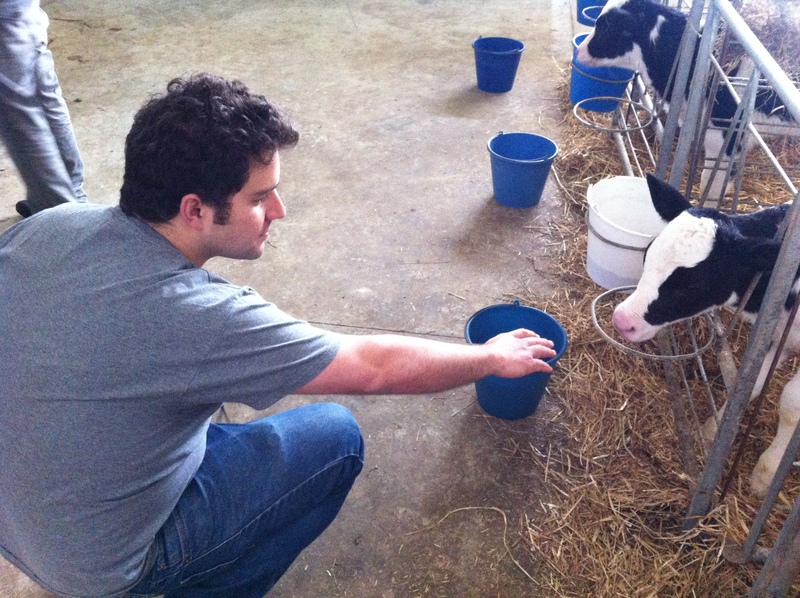 Visit to Iztueta Dairy Farm | eat. write. smile. 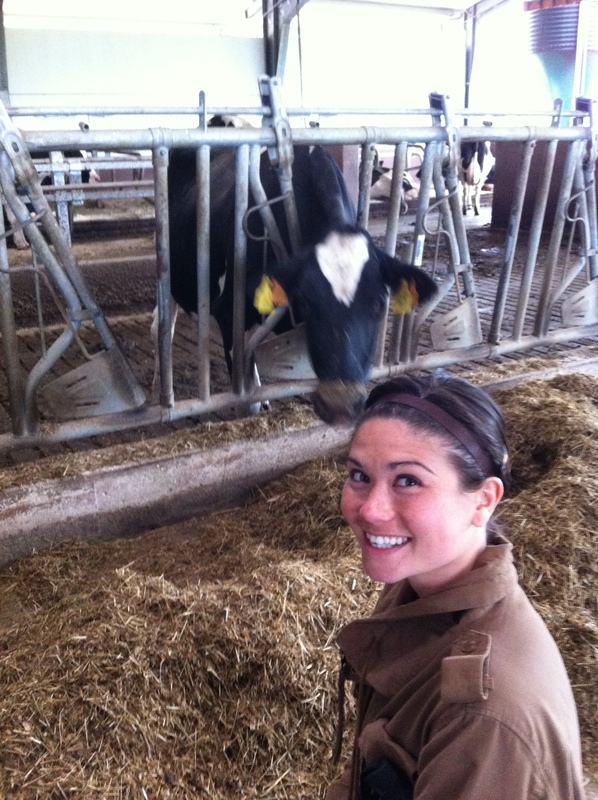 “Careful, that calf is nine days old,” the fourth generation dairy farmer told us. We were kneeling in front of six large stalls with young calves inside, all a little skittish with new visitors around. Fresh off their afternoon feed, the calves were licking each others’ lips, still hungry for a bit more. It was a fascinating bovine French kiss, and Elisha and I had front row seats. So what we were doing with these cows? 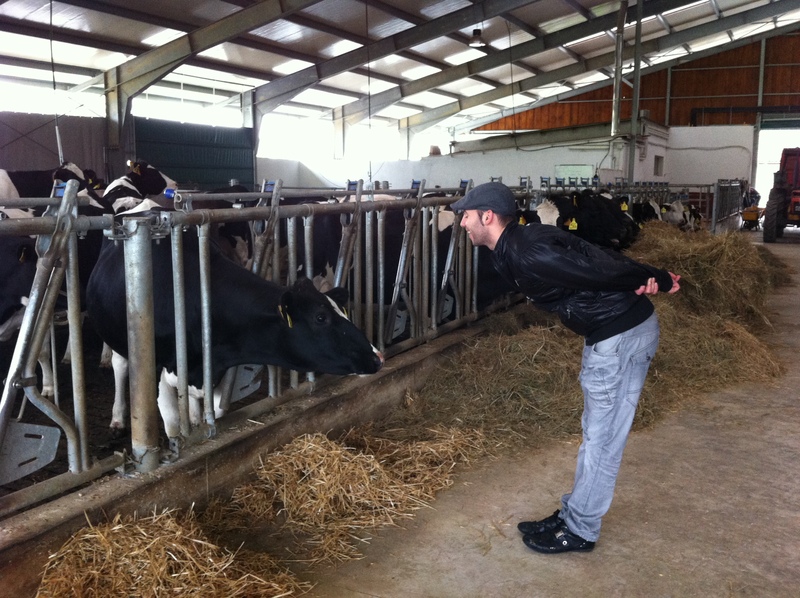 This week we visited the Iztueta Dairy Farm, just two kilometers up the hill from Beasain. It was a chance to visit local farmers, to see a profitable, small-scale model, and to learn about responsible farming and animal husbandry. 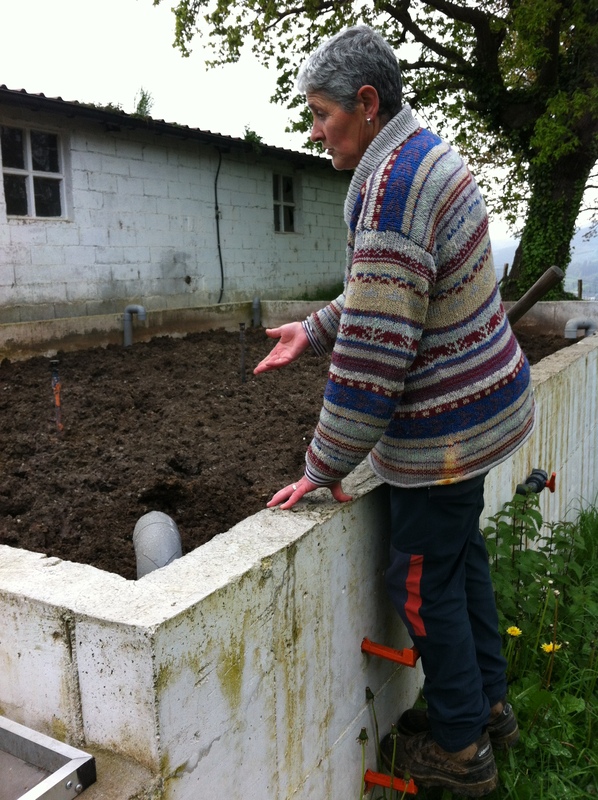 Iztueta filters all waste water through this depuration tank, where thousands of earthworms help clean the water before it flows back to the natural watershed. Iztueta provides TPT bakery with milk that has not been UHT treated, which means it actually tastes like milk. 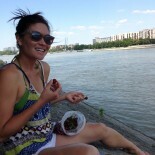 TPT’s owner, Alazne, organized this visit to one of her most trusted purveyors. 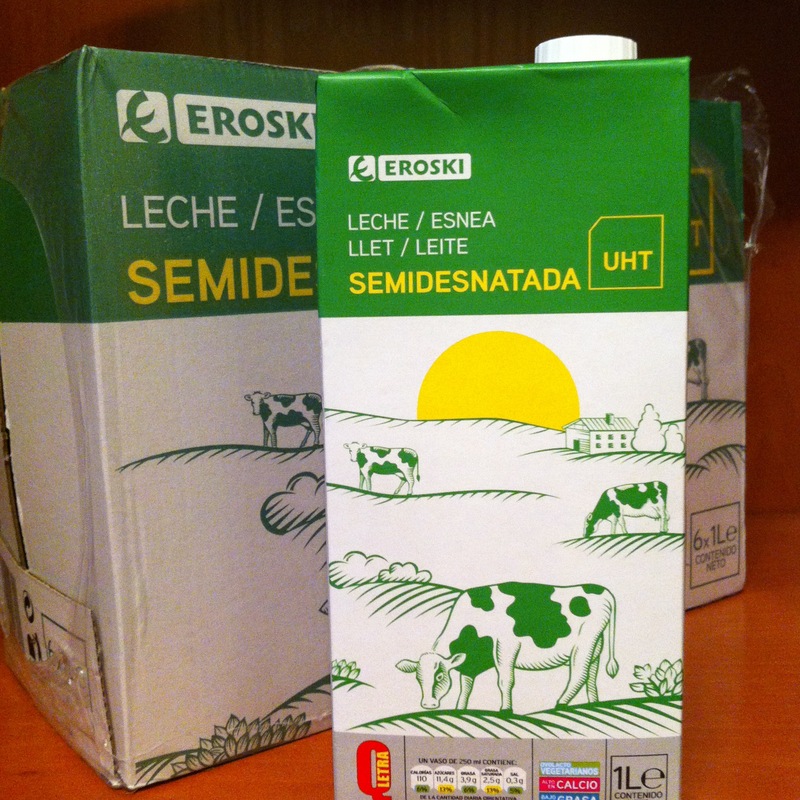 First, some context on milk in Spain. My first visit to a supermarket was shocking: milk is stored on shelves, right next to cereal boxes. It’s sold in cases, stored at room temperature and can be kept for up to three months. How is this possible, I wondered? I’ve since learned that nearly all milk here is ultra high temperature processed. By cooking to 275 degrees Fahrenheit, the milk is sterilized. (In comparison, pasteurization occurs at 161 degrees Fahrenheit, a temperature hot enough to reduce pathogens but low enough to avoid toasting the milk.) Stores can stock UHT milk by the pallet and store it outside of refrigeration. However, the high temperature treatment also kills the flavor, because it denatures natural proteins in milk and caramelizes the sugars present. Thus, UHT milk is a sweet, bland, vapid cousin of fresh milk. 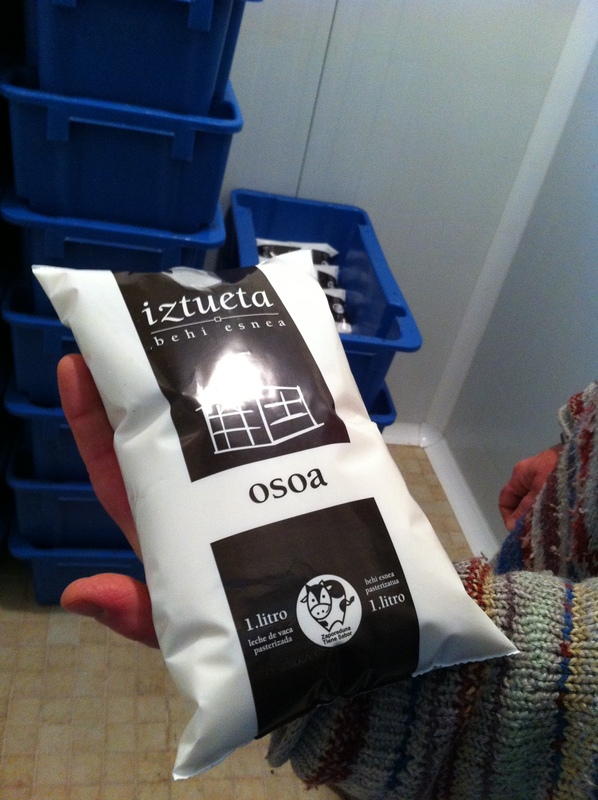 Luckily, there are still some dairy farmers in Gipuzkoa who produce fresh (pasteurized, non UHT) milk, such as Iztueta. 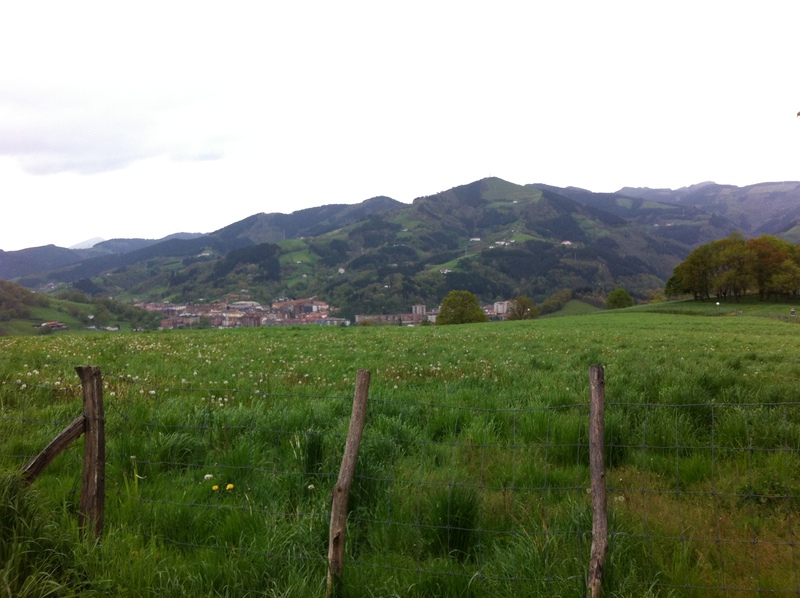 The rolling green hills of Pais Vasco are the perfect grassy environment for cows to graze. As soon as the spring rain stops, the cows will head out to pasture. However, until the sun comes out, they will stay inside to avoid erosion and soil damage. Iztueta caps their milking cow numbers at fifty, which allows them to keep a close eye on the health and well-being of their Holsteins. The cows do not have names, but they are numbered to keep proper records. After artificial insemination and a gestation period of nine months, the cow gives birth on her own. The calf is then separated from the mother several days later. 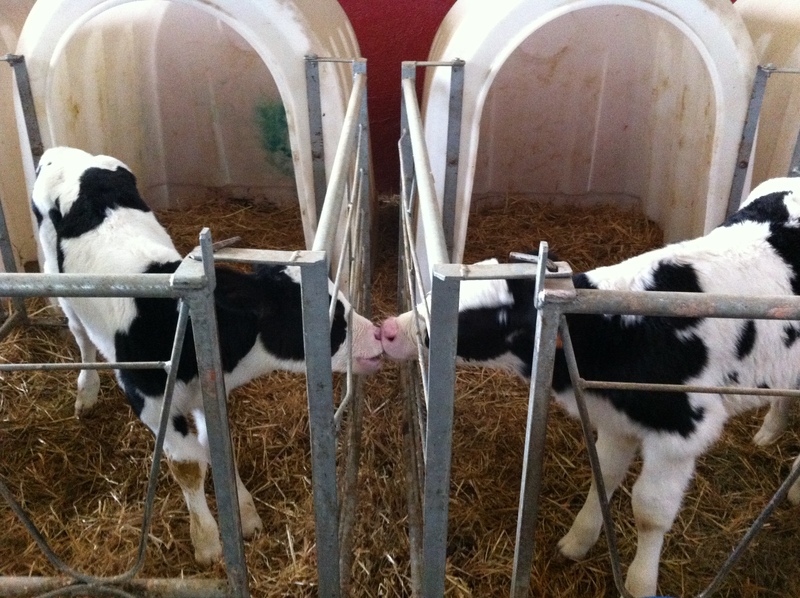 If the calf is female, she will stay at Iztueta to become part of the next generation of milking cows. If the calf is male, within one month he will be sold to rancher’s cooperative in Navarra for beef. The mother cow will be milked twice a day, around 6:30 morning and night . Iztueta’s policy is to wait at least 45 days before the cow is artificially inseminated again. 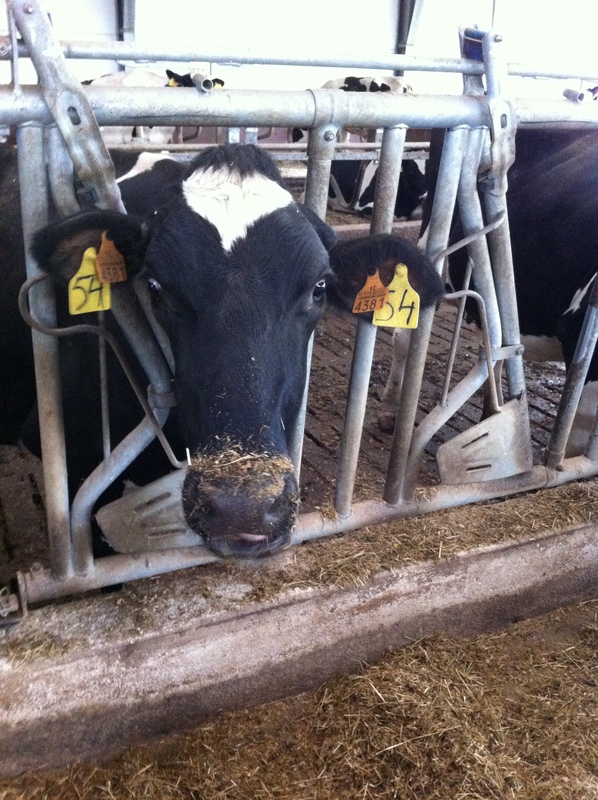 The milk collected is pasteurized on site, heated and quickly cooled to reduce the number of pathogens present. 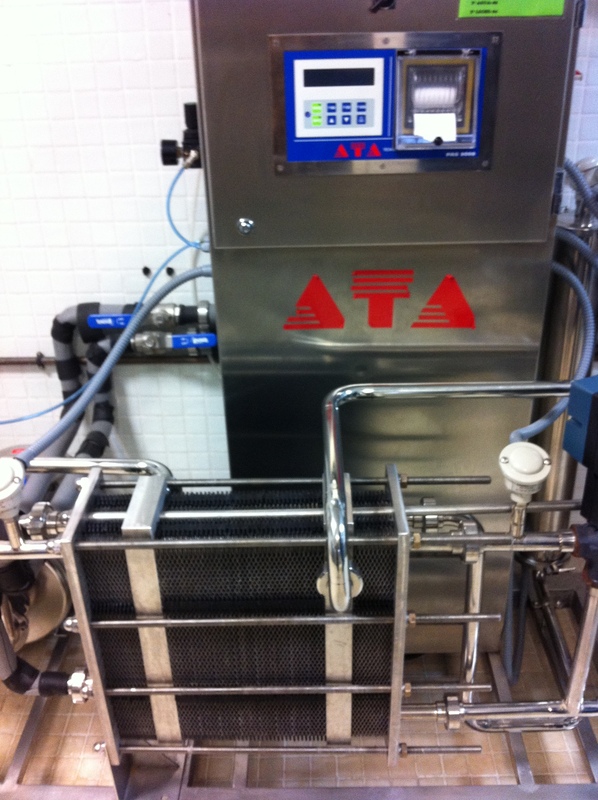 The Pasteurization process occurs in the black sheets of the box on the lower left. The milk quickly filters through in a zig-zag pattern, heating and then cooling back down rapidly. 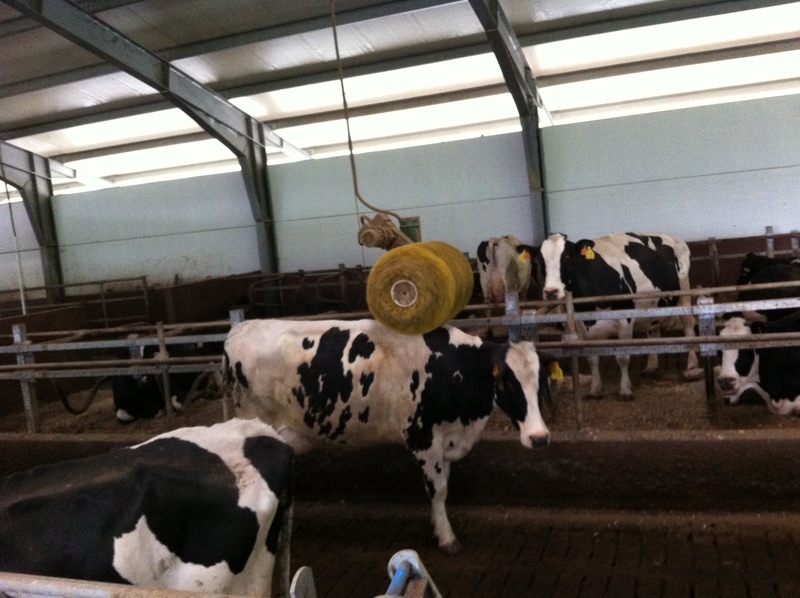 Before visiting Iztueta, I never knew much of anything about the life cycle of a milking cow and the subsequent commercialization of the milk. Of course, when one stops to contemplate the biological processes necessary, it’s obvious that a cow must give birth and then be milked. However, I had never taken the time to think about it, always just accepting that milk simply existed. It was a really important experience for me to see the cows, to see how they live, to see the calves who must be born for cows to lactate in the first place, to see the way in which they are milked. The experience reminded me that milk doesn’t simply exist; it comes from a healthy animal whom we must take care of and feed properly, an animal we must respect. Our visit made me value this everyday commodity- milk- much more. It also underscored the taste difference between fresh (still pasteurized) milk and UHT supermarket milk. 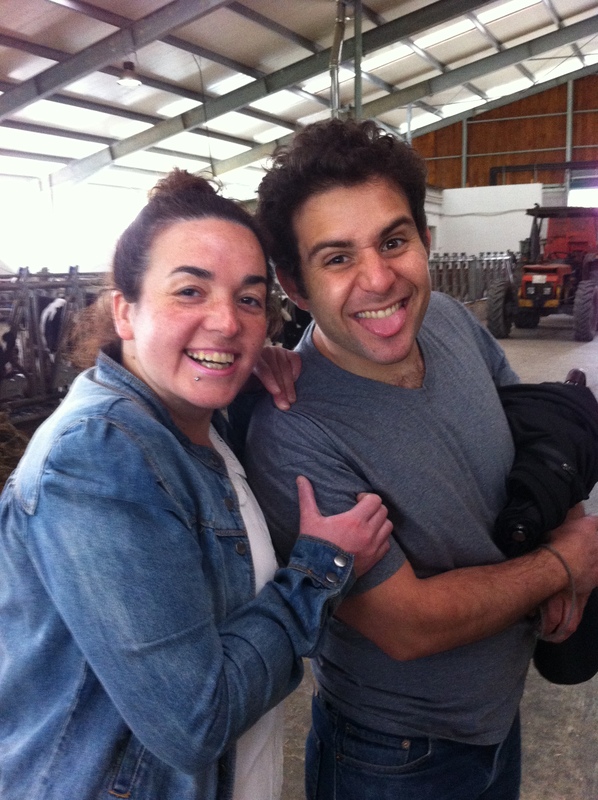 Thanks to Alazne, Sonia and Javi for taking us up the hill to visit this dairy farm, and many thanks to the Iztueta family for sharing your operation with us. Eskerrik asko! Sonia and Elisha have a laugh. De acuerdo Ruthie ; llego el 27 a Donosti ( alquile un piso cerca de La Concha ) con mi hija Pili de 10 anhos asi que te contactare cuando llegue (creo que tienes mi email ,sino dimelo ) . This entry was posted on April 29, 2012 by Ruthie in BasqueStage, Travel and tagged Basque Stage, ingredients, Iztueta Esnea, milk, TPT.